Hello friends and VR lovers. 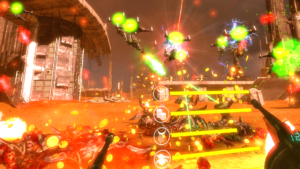 After Arcadia that pushed Serious Sam VR: The Last Hope to the verge of being finished, it’s finally time for Croteam VR to show you the great Skills and Power-Ups system that we have been working on since day one. For the first time in series history Sam is not limited by his weapon handling skills and is able to annihilate even bigger alien armies thanks to the all new Skills and Power-Ups update. With this update general Stone gains access to a skill tree that allows him to unlock passive and active abilities which players can buy alongside weapons and ammo in the shop. Skill points are unlocked by completing planets. Higher difficulty levels bring even more points that players can use to set up their skill inventory to better match their play style. Lay waste on your enemies with tactical orbital lasers and plasma cannons, slow down time, create holographic decoys, release swarms of flying quadcopters, unleash an army of spiders, place minigun turret defenses or simply create giant explosions! The Skills and Power-Ups update includes options to improve and upgrade weapons by finishing perfect runs. Players can gain one weapon upgrade per difficulty per planet, and unlock even more by playing future content that is yet to come. What are you waiting for? Jump in and play!